Below is a collection of books of many descriptions: self defense, forms, exercise, practice: all showing more faces of this fascinating art. A Pearl From The Dragon's Neck is dedicated to “hit medicine,” a useful and some might say essential branch of Chinese martial arts. Tom Bisio's book concentrates on subjects to cure diseases, to speed healing of injuries, to maintenance of health. What distinguishes “hit medicine” is its attachment to martial injuries and cures, and there is good historical indication that this medical branch predated (as a matter of fact, contributed to) the later more sophisticated systems of Chinese medicine. The text offers instruction on how to locate and stimulate points and channels, then apply that knowledge to classical structures such as revivial points, San Cai points, Five Intersections, 12 Miraculous Points, etc. 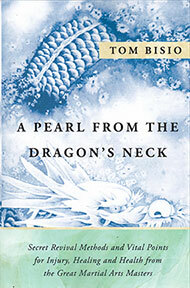 As Bisio writes, "Although A Pearl from the Dragon's Neck has a sequential structure, one can pick up the book and begin almost anywhere. You can literally page through the book, find something that catches your interest and begin there." "Revival methods are very important, not only in martial arts settings, but also in the context of sports, and first aid situations in daily life. Revival methods do not just restore consciousness. They are also reactivate the internal Qi Dynamic, and immediately begin undoing the damage that begins to accrue immediately following a blow to a vital point during an acute event like a stroke or heart attack." This book boldly demonstrates the result of decades of research by the Shotokan teacher and student of Sensei Ohshima, Caylor Adkins. Compiling fifty years of experimentation, he has developed a special set of aids for martial training, utilizing a ball, empty hands and a stick. He takes cues from writings by top teachers Lu Wen Wei and Wan Lai Sheng, and some insights gained from his brother’s study with Han Ching Tang. These movements are very concentrated; you will have to get used to his tight, contracted rolling. Activating one’s body with a ball like this heightens the unified sensation in each movement. These patterns introduce special exercises and observations that can be repeated independently, one at a time. Many actions explicitly show key principles also found in Chinese martial arts. What is dynamically shared here is a unifying thread in these crucial principles. He generalizes his findings with the ball to empty hand and stick work, generously citing many of his sources. He also introduces some Kata, performable in any of these three modes. Stemming from Sensei Adkin’s deeply fight-oriented approach are some outstanding martial anecdotes and stories. Here is the link for the original Chinese book on circle training. Hong Boxing is said to have arisen during the Chin Dynasty. Its fame blossomed during the Ming and Qing times. Among Chinese minority culture, Hong Boxing is strong in ShanXi, Hebei, and Henan provinces where it is a major form of the art. Its content is rich, with numerous forms, comprehensive techniques, and a high level ethic, especially for family virtues. It gives a miraculous presentation with techniques including sticking and leaning, fierce legs, sly striking and attacking. If you want a truly Long Arm style, this is it. Wide ranging whip punches mix with squatting and “lift the curtain” movements. The foot work matches the growing and shrinking of the swing punches; not always easy to find in some versions of Long Arm—actually, a little unusual but welcome. This is a good example of Long Fist’s diversity and adaptability. You can almost sense an invisible spear between the hands. This form follows, generally, the traditional “one step, one strike” structure of many Long Fist forms. The book itself has both Chinese and English and is well illustrated; the English is minimal. On the other hand, this should be an easy form to acquire for someone with experience. It comes with a companion VCD, with English subtitles. Teacher Jonty Kershaw has produced one of the first books in English with a set from the Kun Lun system. Though rare outside of China, Kun Lun is a large system like Shaolin, with many branches. Kershaw teaches from a Taoist perspective and this form, which he learned from Jason Baaht, is a short and relatively simple introduction to the Kun Lun curriculum. It makes use of a lot of sweep blocks, as befitting the dragon arts. The pictures are a bit small but give enough for instruction. Every page has a “footwork box” for stance and weight distribution. There are no applications because Kerhsaw states that he did not want to encourage that one dimensional idea that every move in a form is representative of limited, specific technique. This is a translation of a book originally published in 1933. It is a thin but very interesting volume: essentially an essay on the practice of internal arts. Most books in the martial field are instructional but there are a few such as Adam Hsu's and Daniel Furuya's which are reflective, based on an self-awareness of the nature of practice. This book is one of the best we've seen attempting to explain the rationale of standing practice, relaxation, internal studies etc. It originally garnered some ire from that other outspoken group, the Yi Quan members. But many of the ideas have been adopted since its initial publication. Still, there is much fresh and honest material here. Excerpt: "In fact, the so called dan tian is neither a point of concentration or a point of tension. Disciples of the Tung Shan sect, while in sitting meditation concentrate upon the area between the eyes, therefore their dan tian is between the eyes. For others who practice cultivating qi and internal strength boxers who concentrate upon the tension of the abdomen, it is therefore located below the navel...."
Printed in Hong Kong this neat little book is EN FACE, that is, both Chinese and English versions are represented. Not only a nice set with clear illustrations but a good book for those wanting to improve their martial translation skills. "Ganzhi Meihuazhuang (Plum Blossom Pile Boxing) is one of Chian's ancient boxing schools. It had its own unique style and attack-defence art. According to senior wushu masters, previously Meihuazhuang was practiced on stumps. In line with routines, several hundred stumps, each for one step, were planted on a rectangular ground. Stumps were heightened as practitioners improved their skills." This is probably the first book translated into English on the Jiao Men (Cha) group of Kung Fu branches. The books starts with a short introduction to the history of Muslim versions of Kung Fu. Next is a section on Wang ZiPing then on Zhang WenGuang. This is followed by three sets and an exercise section illustrated. The first, simply titled Zha (Cha) boxing is in reality a version of Road #4. The next is a 10 road Tan Tui (Spring leg). 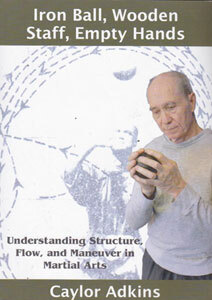 Third follows a 20 exercise section developed by Wang ZiPing himself. Finally there is Yong ZhanQuan of "Boxing for the Brave" which is composed of kicks, strikes and grabs and has some simple applications thrown in for good measure. First of all Fan Zi or Ba Fan Shan is an old and respected school of Kung Fu. It is also "well married" in that it has been teamed to other significant styles through the ages. Two of these would be Chuo Jiao (Penetrating Foot) and Ying Jiao (Eagle Claw) both of which have added Fan Zi to become hybrids. This particular form of Fan Zi goes back in one form or another to Qi JiGuang the famous general who was a martial arts connoisseur. The hands are held together as though manacled for most of the set. This book also discusses the "flavor" of Fan Zi and then, for the final section, gives many forms of usage especially emphasizing the cuffed hand position. A good clear text with a learnable well organized set and many applications. See the Chinese version of this text. WuSong has long been one of the favorite characters out of the Chinese Heroic novel: Water Margin (also known as "Outlaws of the Marsh" and "All Men are Brothers"). WuSong is escorted by official guards but, even though manacled, defeats his opponents and escapes. He is also famous in the novel for fighting a tiger. WuSong Breaks Manacles is a single person form. There are well known and popular multiple opponent versions where the player has to fend off attacks by armed assailants. Much of this form is demonstrated with one hand grasping the other wrist as though the hands are cuffed. As a figure from Water Margin WuSong actions might relate to Liang Shan style or MiZong, though the author of this book was a specialist in Hua Boxing. Clear illustrations and instructions. Click HERE to see another text on this form, in both Chinese and English, and with a VCD!